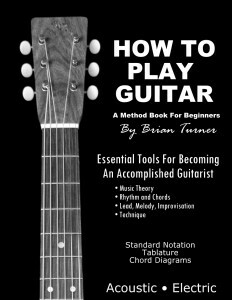 Brian offers Private Guitar Lessons to guitarists of all abilities at very reasonable prices. Whether you are a beginning, intermediate or advanced guitar player, let Brian Turner coach you in his private studio located inside Humble Music Center, Humble, Texas. He has students from all over the area: Atascocita, Kingwood, Huffman, Porter, Houston, Spring and beyond. Brian can take you to the next level in your playing with a lesson plan that is made just for you according to your needs. Contact Brian Turner at 281-354-4456 or e-mail brian@guitarlessonsbybrian.com. So, you do not live close enough for private guitar lessons? No problem, private lessons are now available using Face Time or Skype. Face Time is available for mac users while Skype is available to everyone. Skype is a free download at Skype.com. Learn one on one as if you were in the same room taking private guitar lessons. The worksheets and assignments are furnished via the website and emails.